1. "carrying the theories, concepts, and vocabularies of Chicana feminism across the linguistic border between English and Spanish as well as the ideological border between Mexican academics and activists." 2. 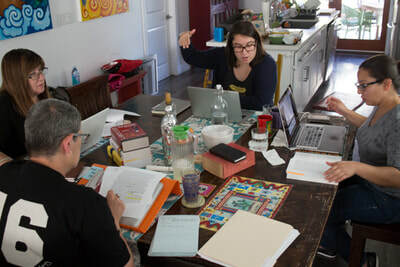 "the work of the Codex Nepantla Collective will render Chicana theory in another language, actually, in a double translation, not only from English to Spanish, but also from the often inaccessible language of theory to a more common language rooted in the personal voice." 3. "using visual art to conceptualize Chicana feminist terminology, thereby expanding the praxis of the translation to include images, we can override some of the perceived linguistic deficit of many Chicana theorists for not being fluent in Spanish. 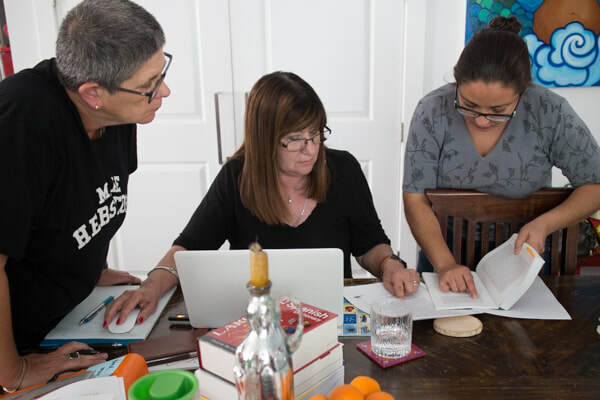 Indeed, this lack of fluency in Spanish by the Chicana authors of many of these English-language texts makes the interpretive power of art critical to the project." Reading each work, summarizing, and interpreting the work. The introduction informs us that we are going to be looking at history, taking what is written and taking it into new territory (i.e. Chicana/o Studies, Women's Studies). 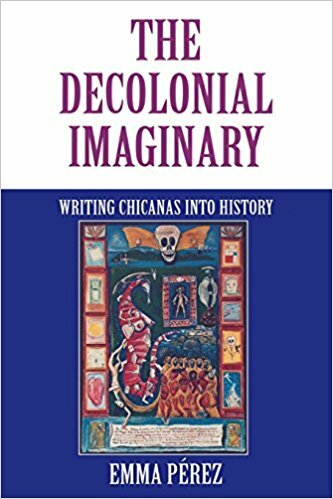 "The decolonial imaginary in Chicana/o history is a theoretical tool for uncovering the hidden voices of Chicanas that have been relegated to silences, to passivity, to that third space where agency is enacted through third space feminism." Pérez says they want to take the "his" out of "history," bringing the focus on women instead of men because the woman's experience has always been neglected. Even when women have been documented it has always had some tie to a man or male figure. This is to challenge what has come before and making the conscious effort to decolonize Chicana history, gain exposure, etc. Decolonial Imaginary: "A rupturing space, the alternative to that which is written in history. That time lag between the colonial and postcolonial, that interstitial space where differential politics and social dilemmas are negotiated." In this body of work Pérez explores this notion of the "decolonial imaginary." It serves as a political project through which one can reconceptualize history that has been presented to us especially Chicana/o histories. They want to explore not only how others have come to interpret and see Chicana/o history, but how Chicanos themselves have come to study it. They bring up the notion of Chicana/o historical consciousness. Pérez really explores and emphasizes what colonial history has done to women's voices, particularly Chicana voices and women of color. Arguing that the spaces in the linear looking at history are the spaces where decolonization can take place. It is often overlooked, but it is an opportunity. Pérez is putting on a gendered/sexed lens to understanding and viewing history. They are looking to set women's stories aside from any relation to a man. They are giving women their own narrative and their own space. "Women's voices and actions intervene to do what I call sexing the colonial imaginary, historically tracking women's agency on the colonial landscape." While this is a subject/topic that could be extremely difficult to translate or interpret on a global scale, I feel there is room to try and make it as simple as possible in order to reach audiences across cultures, countries, etc. I imagine that folks in other spaces and countries have an understanding of what it means to study history. If this is the case then it's a matter of presenting this information in a certain manner and breaking it down. Oftentimes folks within this space or this country aren't even privy to these works and this knowledge. It would be extremely important to define terms clearly and give clear explanation of each different notion so it can resonate and so folks can understand. It's really difficult to explain these topics within the same Chicano community so it's important to take it slow and be ready to be patient. In this piece of work Gonzalez explores Chicano spaces, specifically spaces within the Chicano community that are dominated by men and/or straight men and women. It explores the notion of misogyny and what that looks like within Chicano culture and how it affects the women within the culture especially Chicana lesbians. It explores how Chicana lesbians are the most underrepresented within the community and even on a larger scale. The reading also covers identity and what that means and how it can be perceived and formed. For example, the notion of identifying as a woman- what that looks like and how this identity is performed and perceived within the community. It's important to note that the woman and lesbian identity don't necessarily go hand-in-hand, "difficult to create a lesbian identity without some woman identification, but not all women-identified women are lesbians." On a global scale this would be a very difficult subject and reading to translate and interpret. It can get really dicey starting with the identities and the context within the culture itself. There are a lot of cultural aspects to flesh out within this reading. There is a lot to translate and to cover not only within the Chicano culture, but specifically the Chicana lesbian culture. 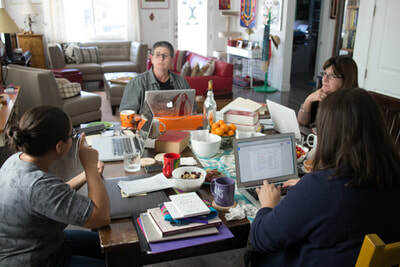 Chicana lesbianism holds a lot of context and it would need to be carefully detailed starting with definitions of what exactly it means to be Chicana, lesbians, and then the intersecting identity. The culture itself would need to be explained/explored within the context of the United States as well as globally/internationally. The reading discusses how here in the U.S. there is really no space for it and there's a hope that there might be someone elsewhere that finds this material useful or that they can identify with it. In this work Pérez dives into sexuality and how the symbolic reading of sexuality is at the core of the problem. It dives into the complexities and intersections of being a gay woman of color not only within the paradigm of the white male/male community but within the white feminist community as well. Pérez uses theories and ideologies of white male theorists to break down the dynamics of sexism, racism, and homophobia. It's a using of what wasn't necessarily made for you to progress your own work, to benefit you and your community. It's making it work. "My lesbianism is the avenue through which I have learned the most about silence and oppression. . . .In this country , lesbianism is a poverty-- as is being brown, as is being a woman, as is being just plain poor. The danger lies in ranking the oppressions. The danger lies in failing to acknowledge the specificity of the oppression. " I chose this particular project to work on because I really believe in the work itself. Chicanas are a particularly underrepresented group within society and even on a global scale. When you add the intersection of Queerness then you gain even more invisibility, etc. As someone who identifies as a Queer Chicana I have seen firsthand the lack and need of this kind of material and this kind of work being done. Interpreting and translating these works is a huge deal. It is going to bring access to so many folks who otherwise might not have access or even just difficulty following, etc. This work is personal to me and I am excited to be part of something so special. ​Chicana Praxis - It is Chicana Feminism, philosophy and theory in practice. Digital Humanities​ - The notion of using Digital Humanities as a form of social justice. Intangible Heritage - The knowledge and culture that is given and passed on through generations. Something that is invaluable. This is what Chicanas do! Through the various themes of the readings and bodies of work, an impact can be made on several communities including the Chicano community itself. It's important to note and highlight that the work being done is in the effort of trying to make an impact in the lives of folks who are searching for this material and pedagogy. The themes encountered throughout these bodies of work are crucial for the Chicana lesbian community. The great part is that it can reach further than this community alone and it hopefully will through the hard work and dedication of the larger team and even through my small contribution. As mentioned above, it is a form of social justice! Giving this community a voice and representation is just the start. Taking it globally is something that would be incredible because it's almost certain this could resonate globally as well. Reflecting back on this project I'm left feeling a great sense of gratitude and admiration. It's incredibly humbling to be asked to contribute to a project of this sort on any level. This is work that really hits home for me and resonates deeply. When my professor approached me with this project I couldn't say no and I knew it would be worthwhile, if not only for myself but for folks within this community and even with folks outside of this particular community. That was and is the goal. It's had an immense impact on me even on a scholarly level. I have learned so much from the readings and reflecting I have had to do on the bodies of work. I'm left with more knowledge on topics and areas that have to do directly with me and I can identify with on a personal level. My hope is that it has a positive impact on my community partner which is my professor and her collective and that my contribution is of some service in some way or another. Further than that I really sincerely hope that this will have an impact on the larger community. That someone within the Chicana lesbian/queer community will finally see themselves in this work and/or benefit in some way from the work being done. Globally it's harder to see and imagine, but I would hope the same. I'm left in awe of the work being done in this collective and with hope for the future! Thank you! ¡Gracias!